"Wands only look like they're too fragile to be deadly." The Magic Wand, the magician's all-purpose Weapon of Choice. The Magic Wand is a unique weapon in that unlike swords, bows or guns, this weapon is generally not for use in physical combat, but is instead a purely magical weapon. In general, a Magic Wand is any device that enhances magic for producing spells, or aid in combat, or—less frequently—enables the use of magic in the first place. Circe used a Magic Wand to convert Odysseus's men to swine, thus making this one Older Than Feudalism. When The Magic Wand is big or strong enough to be capable of both magic and melee combat a la Simple Staff or Carry a Big Stick, the resulting hybrid-weapon is a Magic Staff. If the wand in question appears on a fortune-telling card, it's Tarot Motifs—likely either the Magician or the Ace of Wands. Sometimes in Anime and Manga, a staff's powers will be tied to an onusa for use by Miko or onmyoji. These also tend to be more associated with fairies, especially Fairy Godmothers, than wizards. Not to be confused with Magic Tool, which is a mundane implement that appears magically competent. The Trope Codifiers in anime and manga are Sally from Sally the Witch (who is seen using one in the OP of the 1966 series but not in the series itself, and later gains a genuine one in the 1989 remake) and Chappy from Mahou Tsukai Chappy (who does use hers regularly). The Devices of Magical Girl Lyrical Nanoha are the Magitek version, especially the "Storage" Devices. All other forms of Device are also Empathic Weapons and Swiss Army Weapons, but their primary purpose tends to be running calculations for magic circles (magic in Nanoha is based on highly complex mathematics and the devices help streamline the process). Mahou Sensei Negima! has staves, rods, and standard wands as being necessary for casting most forms of magic. The Magic Knight characters who opt to fight in close combat instead use wands in the shape of rings worn on their finger, so as to leave both of their hands free in a fight. In the Haruhi Suzumiya Brigade-movie "The Adventures Of Mikuru Asahina", Yuki wears one as part of her costume. It's called the "Starring/Sterling/Starling/Stirring/WTF? Inferno"! In Azumanga Daioh, Tomo gives Chiyo a "magic wand" for her birthday, telling her that she can use it to become tall like Sakaki. Chiyo responds that she's too old to believe in that kind of thing. In Rune Soldier Louie the titular character breaks his wand after killing a bunch of demons with it - by bashing them with it, despite the fact that he is capable of magic and other than that his wand is little more than a rather short stick. In The Familiar of Zero, wands are necessary for humans to cast elemental magic, and they can be substituted with staves. Races that utilise nature magicnote Known variously as the "power of the spirits" or "ancient magic", depending on the describer. such as elves and dragons however have no need for wands. Every Magical Girl in Oku-sama wa Mahou Shoujo has one they can materialize at will. In Cardcaptor Sakura, Sakura has a pink wand with a bird's beak and wings at the top. It changes into a star enclosed in a ring, with smaller wings, after Sakura passes the Final Judgment and starts making the Clow Cards into Sakura Cards. Syaoran's Magic Wand is his BFS. In Axis Powers Hetalia, England has one that he can use to turn the other characters into children. The wands of Fate/kaleid liner PRISMA☆ILLYA are the same ones from Fate/hollow ataraxia, including behaviour. While Ruby contracts Illya with a combination of sweet talk, brute force and lies into becoming a Magical Girl, Sapphire is a tad more open towards Miyu. Both wands can also accept "Class Cards" to empower their respective user in different ways and generally shoot magic blasts. Sailor Moon's weapons are all wands -Except for the very first one which is her tiara that throws like a disc/boomerang- they are all royal sceptres that change which each subsequent power up. The wands are: The Moon Stick, shaped as a crescent moon, inherited from Queen Serenity. The Cutie Moon Rod which was created by the love between her and Mamoru (Got it from her mother in the anime). The Spiral Heart Moon Rod, received from Neo Queen Serenity (Created between she and Tuxedo Mask in the anime), the Kaleidomoon Scope that was a gift of Pegasus and finally the Eternal Tier, created by the combined forces of all of the Solar System's Sailor Senshi ChibiMoon have wands too, first she has the Pink Moon Stick and then her next weapons mimics those of Sailor Moon. Little Witch Academia has more modernized wands, with a folding/extension ability, a forked tip to discharge the magical energy, and a magical battery indicator. Most wands in the series look identical, meaning they're clearly school-issued, but other wand models are seen, for instance, in Lotte's parents' magic tool shop. The Cavendishes also traditionally use another type of wand, one that appears to be made of wood, with a length of ivory snaking around it. Then there's the Shiny Rod, which is in a class on its own, and seems more to be a hybrid of this and Magic Staff. Ojamajo Doremi: The witches all get wands to use spells that change every season. Princess Silver uses one of these in Yume no Crayon Oukoku to solve the problems of the townspeople. In Captain Carrot and His Amazing Zoo Crew!, the mystically-powered Alley-Kat-Abra uses a wand which she calls "Magic Wanda". Usually Doctor Strange doesn't need these, but he does have a few wand-like mystic artifacts, including the Wand of Watoomb. Bodie Troll: Miz Bijou uses one in the form of a spatula, though apparently this is a source of contention among her kind. In Queen of All Oni, Jade creates a set of magic fans that she uses in battle, doubles as a Mythology Gag to the Jackie Chan Adventures opening sequence, where Jade is seen with two fans. In Marionettes, these exist, with a pony named Magic Star having been the greatest wandsmith to ever live. At one point, she worked with Starswirl the Bearded and Mage Meadowbrook to custom make wands for the two of them, which are said to be among the strongest to ever exist. The Marionettes, robot ponies made by the Stallions in Black for their goals, have magic wands in their horns, and Trixie's was the one Magic Star and Meadowbrook made. "Watch out, it's got a magic wand!" [...] a short, bone-like stick [...] Working in much the same way as magical traps, these devices could store a few instances of a prepared spell and release it when a trigger condition was met. In Shrek 2 the Fairy Godmother has a wand that she uses to cast magic. Too bad her magic can be reflected by shiny metal armor. In the Disney Animated Canon, the Fairy Godmother from Cinderella and the Good Fairies from Sleeping Beauty have magic wands. Oddly, various Disney media portrays Tinkerbell with a wand, although she did not have one in the actual Peter Pan film. These wands appear to be the source of their power, as the Good Fairies were unable to use magic of any kind without the wands. In Cinderella III: A Twist in Time, it's revealed that anyone can use the Fairy Godmother's wand provided they say the magic words. Both of the stepsisters, the Wicked Stepmother, and Jaq and Gus all use it, while Cinderella is stopped before she can. The dragon controlling scepters in Dungeons & Dragons. Glinda the Good Witch from The Wizardof Oz has a very long one. The Black Witch Chronicles: Wands turn up all over the place. The Gardnerian Mages can't do magic without specially-made wooden wands. This is because, contrary to what their leaders claim, they're actually descended from Dryads. Dryads themselves don't need wands, being able to do magic with just plain old sticks. The two most powerful wands in the world are the Empathic Weapon White Wand and Evil Weapon Shadow Wand. Practitioners of rune magic often use wands to write their symbols. Breakfast of Champions: "Patty Keene actually imagined Dwayne's waving a magic wand at her troubles and dreams." This is followed by Vonnegut's drawing of what the wand would look like. Non-wand variant: In Return To Brookmere, a vintage Choose Your Own Adventure book, the Mouth of Mimulus is a magical amulet with the power to cast spells for its wearer. Combined with Companion Cube, as Mim can speak and has a personality all its own. C. S. Lewis' The Chronicles of Narnia: In The Lion, the Witch, and the Wardrobe, the White Witch's most feared power is her wand, which can turn people to stone. Edmund saves the day by going for the wand instead of herself, which everyone before him had been fool enough to do. In Robert E. Howard's Conan the Barbarian story "Red Nails" Tolkemec finds a magic wand that kills at a touch. In "Black Colossus", Thugra Khotan's ebon staff can turn into a snake. Wizards and witches can both use wands. Wizards can also use staves. However, for wizards they tend to have their wands by them at all times, and find them essential for magic. Witches, on the other hand, will make use of a stick they find on the ground for their wand. The rest is just tinsel. ... "A wizard's staff has a knob on the end..."
Fairy Godmother wands are something else entirely. Instead of being a conduit for the caster, they are powerful in themselves. They're orders of magnitude more powerful and reliable than any other magic in the setting, bypass several of the laws of magic (which even Sourcerers who can curb-stomp the gods have to obey), and are irreplaceable relics from so long ago nobody knows who made them. They also have simple and intuitive controls, but that they are controls is easily missed. "PSPSPS It has tendincy to resett to pumpkins but you will gett the hange of it in noe time." Princess Florinara Tansimasa Qasilava Delagordune in Dragon In Distress uses as her weapon of choice a magic wand. The Dresden Files: In the Dresdenverse, wands and staves, are magic foci. Harry Dresden has both a staff and a "blasting rod", which is a hand-carved stick the size of a small baton, enchanted to focus his fire magic, while the staff is more general use for his air and force spells. The blasting rod also has the advantage of being more concealable. Foci help a wizard's mental construct of a spell — while he or she can cast the same spells with or without foci, they're much harder to form and control. For instance, Harry's blasting rod helps him focus his fire into coherent beams to hit specific targets and limit collateral damage, while without it, he has a tendency to set buildings on fire. In the tabletop game, both staff and rod are defined as focus items that make "spirit" and fire magic respectively easier for Harry to control and thus safer to handle, especially at full power. His trademark "Fuego!" spell is also defined as a rote (automatically castable at fixed strength, no roll required) evocation specifically tied to his blasting rod  without it, he thus doesn't just lose the rod's control bonus but also one of his few reliable combat tricks and has to take his chances casting off-the-cuff fire spells just like any other wizard with rather more power than control. Changes has Molly using a pair of wands with ivory tips. A somewhat surreal version in A Fantasy Attraction: A spork that transforms people into baby animals. Magic wands are Schmuck Bait in the Verse of Simon R. Green, as they're created solely by The Fair Folk who despise humanity for driving them from the world. Any human stupid enough to try to wield one is liable to fall prey to whatever Booby Trap or curse the elves have rigged it with, so human characters in the Nightside or Secret Histories series typically prefer aboriginal pointing bones if they want to blast someone by poking a stick at them. Only Larry Oblivion uses a wand regularly, and he only gets away with doing so because he's dead. In Harry Potter all but the most powerful wizards need wands to cast any kind of spell. The only magic they seem to be able to do without a wand is teleportation, and maybe potions, though Word of God puts some doubt into the latter, as a muggle can't make a potion and you do more than stir at some point. Magic without a wand is "unfocused", but definitely possible. Most underage magic is done without a wand, and even though Arianna Dumbledore was never given one, her magic remained dangerous. Harry holds three wands in one hand at one point, casting a triple Stunning Spell. Sadly, this is the only application of More Dakka to magic. The Animagus transformation also does not require a wand — Sirius was able to do it to lessen the effect of the Dementors in PoA. This makes sense, because otherwise an Animagus without opposable digits wouldn't be able to hold their wand to change back to human form. However, becoming an Animagus in the first place probably requires a wand. Wands are normally Loyal Phlebotinum, but they will switch their allegiances if their owners are defeated by another wizard/witch in a struggle. Draco Malfoy loses his own wand and his claim to the Elder Wand to Harry after the latter physically wrests it away from him. Hermione, by contrast, can't make Bellatrix's wand work as well for her because she never directly proved she was stronger. "The wand chooses the wizard", and all wands wish to be wielded by the most capable ones possible. The companion site, Pottermore, contains a lot of supplementary information on wandlore. There are three elements that determine the nature of a wand: its length, wood (elm, rose, etc), and core (unicorn hair, phoenix tail feather, etc), each affecting the wand in its own way (wands made of walnut wood seek out intelligent wielders, dragon heartstring cores make powerful wands but are easy to turn to the Dark Arts, and so on). The combination influences the wand's strength with different kinds of magic and its compatibility with personality traits. The site also shows that wandwork is required for potionmaking, though this might be Gameplay and Story Segregation for the potion minigame. Obscurials (young witches or wizards that suppress their magic to dangerous extremes) can turn into big dark clouds of destruction without wands. The Hobbit: Gandalf himself is shown using a wand several times in the book, using it mostly as a torch but also in more magical ways. He is described as pulling the wand from his robes, so it isn't just another word for his staff. His name even translates to modern English as Wand-Elf. Every thaumaturgical procedure practiced by Sean O Lochlainn or his fellow-Sorcerers in the Lord Darcy stories makes use of a wand, with specific magical tasks requiring different ones. This, plus all the other equipment their spells require, is why magic-users in that Verse need to carry a carpetbag full of stuff. In L. Jagi Lamplighter's Prospero's Daughter trilogy, Prospero made all his children magical staffs. Fairy Godmothers in Tales of the Five Hundred Kingdoms (those who are merely human and not True Fae) use wands to help focus and contain magic. As a Godmother's apprentice, Elena once uses one with a big gold star at the top, just so people will know it's a wand. In the first book, Moiraine has a long white wand that she uses to focus her powers. It's a sa'angreal, a high-order Amplifier Artifact, and is used later by a group of Aes Sedai to Heal Mat Cauthon and much later by Egwene Al'Vere to repel a Seanchan raid on the White Tower. It becomes her Weapon of Choice during the Last Battle, too. Another wand is the Oath Rod, something called a "binder" that was originally used to bind criminal channellers but now used by the Aes Sedai to make their oaths. Then there's a black rod that creates balefire and was stolen by a group of Black Ajah. Because balefire is so dangerous and the rod so hard to control, it would only be used by someone very foolish or very desperate; as such, it gets used just about every time that group appears in the series. Supplementary materials also make mention of the Rod of the Waves, which can summon fish, and the Ebon Rod, which creates illusions. In the last book, Demandred wields Sakarnen, a sa'angreal even stronger than Rand's Calllandor at the Last Battle; it resembles a scepter with a cut-shaped ornament at the top. Near the end of the battle he gives it to Mazrim Taim, who uses it in a duel against Egwene, who is wielding aforementioned white wand. Witch & Wizard - Wisty has an old drumstick which becomes a magic wand. Justified to some extent in the Wizard in Rhyme series by Christopher Stasheff. Wands in that series (and staves, to some extent) serve as magical "antennas", focusing a mage's spells and making them directional. Spells will still work without using a wand, or stave, but the effect is both weaker and far more easily able to be picked up by other wizards/sorcerers. Kinda the difference between using a regular radio versus one with a dish antenna. As spells in this universe are cast through poetry, this can make for some interesting duels. "He's going for the extra point!/Throw his kneecap out of joint! ", etc. By a later book in the series, Matthew's had some time to experiment and found that most objects with a similar shape can do the same. He seldom uses his wand because a dagger can serve the same purpose and is far more practical. Wands are used for combat in the first of the Young Wizards novel, and then mostly dropped in the later books. However, the way they're used fits with certain principles that are explained later. Most wizardries can be done using only the Speech and a wizard's personal energy, but certain materials that vary from spell to spell can make the casting easier or less costly. Hence Nita's wand of choice (a Rowan stick left out under a full moon) is good for wielding weaponized moonlight, while Kit's (a noon-forged steel antenna) can summon jets of molten steel. Schooled in Magic: Wands are used to store spells which have been prepared ahead of time, and are thus the sign of a weak sorcerer who can't cast things on the fly, or muggles. In Through The Motions, magic wands are a staple of any witch or wizard's collection, and a requirement for casting spells. Some wands are made of metal rather than wood, and have a mana indicator on the side to take most of the guesswork out of knowing when it's time to recharge. In the 1979 ITV series The Boy Merlin, Vortigern's Court Magician Grimbold gives Merlin his wand, which he says was "carved from nutwood on a Wednesday". Doctor Who: While originally just a sophisticated tool good for picking locks, the Doctor's sonic screwdriver has suffered from feature creep over the years and  especially in the new series  can do more or less anything. It had become such a writer's crutch by Peter Davison's era that producer John Nathan-Turner had it destroyed (in "The Visitation"). It's returned with a vengeance (and more features than ever) in the New Series, especially in David Tennant's era. War Doctor: The pointing again! What are you going to do, assemble a cabinet at them? The TV adaptation of The Dresden Files has a drumstick standing in for his blasting rod, though he uses a hockey stick for a staff more often. Given that one of the major themes of the series was Harry's attempts to keep a low profile, these substitutions are actually kind of brilliant. A lot of the villains (mainly the leaders) in Power Rangers have various types of magic wands, especially in the earlier seasons. Rita Repulsa: "Magic wand, make my monster grooooooooow!" Big staffs of awesome were required for Power Rangers villains for quite some time - some Super Sentai-created, some not. Even if not magic-themed, there are more than a few things that the villain can make happen by pointing his or her staff at it. Including blowing things up. More series than not have it. In Mystic Force the Rangers use cell phones as wands. (Actually, the wands start out as wooden standard ones with the Ranger's personal symbol on its tip. They were turned into phones to match the modern age more.) Each mode for the Rangers has a different, awesomer wand: Ranger mode has the Magi Staff, all shiny and ending in the Mystic Force M logo, with, again, the Ranger's symbol at its tip. They can turn into weapons, too. In Legend Mode, we trade those for large staves ending in rotary dials. The Russos and all other wizards from Wizards of Waverly Place use wands for most of their spells, though "hand magic" is also possible. In ballads such as Allison Gross and The Laily Worm and the Machrel of the Sea, witches use silver wands to transform their victims. Matra Magna's magic wand (and her disembodied hand) are prominently featured on the playfield of Pinball Magic, which is used to conjure balls at the player. In Sequinox, Winter's weapon is a magical staff with a snowflake head. Foci from Shadowrun are like this. Kind of an odd case because a spell focus can be almost anything, as long as a magician took some time to enchant it. Foci from Mage: The Ascension could be anything that a mage thought was necessary for their magic... but it was all in their head. The sign of a powerful mage is one who became Enlightened enough to realize he didn't need such tools. Mage: The Awakening has dedicated magical tools, which can be any object the mage feels is magically relevant (though there are some special ones based on things like political faction) ranging from traditional wands and goblets to iPods and laptops. While unnecessary, the relevance the tool has to the mage enhances their soul's connection to the source of magic, and thus decreases the chance of damaging reality through malfunctions. There are also rare "talismans", which possess powers of their own. Earlier editions have wands as Limited Use Magical Devices that store multiple castings of a single spell, which can be activated with a special command word or by applying other magical training. 4th Edition features "implements", class-specific magic items that can boost the user's accuracy and damage with magical attacks and that can grant additional class-specific encounter powers. Examples are holy symbols for clerics and paladins; orbs, staffs and wands for wizards; and rods, wands, and pact blades for warlocks. In a similar vein to pact blades, Paladins can use Holy Avenger weapons as holy symbols, and Wizards of the Spiral Tower can treat longswords as either a staff, wand, or orb. The Forgotten Realms Player's Guide introduced the Swordmage class, which can use light or heavy blades as implements. 5th Edition has two varieties of wand. One is a focus item for arcane spellcasting which substitutes for some spells' usual Eye of Newt. The other provides passive bonuses or has a small, recharging pool of magical powers that can be tapped by a wielder who attunes themself to the wand. GURPS features an enchantment spell called Staff, which can be used to turn a staff into a magic device which lets a wizard cast spells through it (so, for instance, touching them with the staff counts as touching the target directly). Since GURPS magic has very limited range, this is rather useful. Optionally you can add a Powerstone to a wand, or put an (expensive) enchantment on it that allows the wielder to cast a particular spell without training. Specific spells may require wands made of certain materials. In the Legend System, the [Arcane] property causes most of a weapon's normal bonuses to apply to the wielder's magical abilities, rather than attacks with the weapon itself. It's assumed, but not required, that such weapons are shaped like a literal wand or staff. The Just Blade track can actually summon an [Arcane] weapon that grows in power as they do, and deliver spells by hitting enemies with it. Ars Magica lets a mage select a magic item to attune as a Talisman: it becomes much more receptive to further enchantments, counts as part of the mage for all mystical effects, and boosts some of the mage's spellcasting. One mage's spear Talisman enhances all spells that cause harm at a distance and can open bleeding wounds by pointing it at a victim. In Ironclaw wands allow mages to ignore range penalties on spells, and in 2nd edition they're included in standard mage equipment. In The Tempest Prospero uses a wand to work magic. (He also refers to it as a "stick" or "staff" at various points). Also worth noting: Prospero subverts the usual wizardly tropes by destroying his staff, voluntarily giving up his powers. In John Milton's Comus, the title character's powers work by a magic wand. In Hansel and Gretel, the Wicked Witch paralyzes the titular children with the powers of her wand and a rhyming incantation, a variation of which she later uses to remobilize Gretel. Gretel manages to steal the wand for the moment and free Hansel with the latter spell, which is used once again after they kill the witch to fully reanimate the gingerbread children. Universal Studios' Wizarding World of Harry Potter attractions now feature interactive wands: gift shop-puchasable replicas of wands from the HP films, with which park-goers can activate "spells" at marked locations within Hogsmeade or Diagon Alley. Waving such a wand at shops' window displays, fountains, or other themed features can activate sound, water, and/or animatronic effects, thus simulating magics from the Potter books and films. Lulu's animated stuffed dolls in Final Fantasy X count. Not only are there magical wands and staves, but the Shaman Class is also capable of utilizing a wide variety of magical totems, each with their own power. Wands act as more of a 'sidearm': most fighting is done with actual spells, with wands being used when one's mana is depleted, or to finish off an enemy that is near death. They also tend to provide useful stats for casters, similar to the weapons these classes will usually carry while casting (mostly Staves, Swords, Daggers and Maces, neither of which get much use as an actual weapon). Relic items, which several classes carry instead of ranged weapons. Most of them boost specific spells. Offhand items are also usually designed to boost spellcasting as casters generally can't use a second weapon or any twohanded weapon except Staves (well, there aren't any with caster stats). More often than not, the various Mage classes in the Final Fantasy games can equip rods and staves. Final Fantasy XI has both the staff and club categories. The club category has many examples of Magic Wand and Drop the Hammer, while the staff category has both versions of Magic Staff and Simple Staff — though the Simple Staff versions tend to be overlooked, in part because almost no jobs can use them well for actually hitting things (and the one job that can does better still with a sword and shield), in part because of the overwhelming fame and power of the magic-boosting elemental staves. Final Fantasy XIV has a number of true wands (for Conjurors/White Mages) and scepters (for Thaumaturges/Black Mages) as well as two-handed Magic Staff options. The staffs have more raw casting power but a fairly unique feature is that the one handed wands can be equipped with light shields for extra defense, useful for lower-level Squishy Wizards going solo. Final Fantasy Tactics A2 has Rods, Staves and Books for its pure magic users. Amusingly, you can make characters whack enemies over the head with the books. The artwork of the Time Mage and the Green Mage wields a wand. While Fire Emblem does have staves (which are mostly used for healing), magic books serve as the game's version of Magic Wand. Being the Kingdom Hearts games' token Mage, it's only natural for Donald Duck to use a magic wand or hammer as his Weapon of Choice. His best weapon is both, being a fancy scepter. Also, a number of Sora's Keychains turn his Keyblade into a magic-enhancer, and in Kingdom Hearts II his Drive Forms include the Wisdom Form — basically a set of clothes that super-enhance his magical abilities. His Master Form also does this, to a lesser extent (but also adds a similar degree of physical power). Final Form simply ramps his magic and physical powers Up to Eleven. In Kingdom Hearts II, if you choose to be magic focused, then Roxas will use a struggle bat in the shape of one. "Mystic Codes" can either amplify the effects of the mage's spells, or perform a predefined function. These can basically be anything that the mage finds fitting and useful, including weapons of various origins (guns are allowed), clothing and accessories (dresses, gloves, etc. ), traditional wands and rods, and even pools of mercury. Caster in Fate/stay night decides for one bad end that since Shirou is so good at projection, she's going to cut off all his limbs and turn him into a Projection wand. But don't worry, she won't kill him. The Kaleidosticks in Fate/hollow ataraxia are also magic wands... and jerkasses that like to dress up their wielders in strange clothing. Wands, as well as some staves and one very notable sword, can store a limited number of spell charges on them in a manner reminiscent of Dungeons & Dragons. These are often nonreplenishable, and since the wands are useless as melee weapons and any seasoned adventurer has a fairly robust selection of their own spells, wands in this game are good only as items of last resort. Necromancers in Diablo II use wands that provide bonuses to their spells, and Sorceresses used Staves. However, they're used as clubs in combat. Weak, easily breakable, expensive to repair clubs: but if you need to use it as a club, you're probably doing it wrong, though they often apply impressive elemental damage to their attacks. One particular unique staff, the "Ribcracker", gives no bonuses to skills but instead has several +damage or +attack speed modifiers. It is surprisingly good for Spam Attack builds such as Zealot Paladins or Werewolf Druids. In Diablo III most weapons are Stat Sticks anyway, so wands can be about as formidable as anything else, but they're optimized to grant bonuses that are helpful to wizards and thus are the preferred gear for that class. Both Sayuri Kurata and Kano Kirishima use a magic wand or staff in Eternal Fighter Zero. Sayuri's wand is more of a Magical Girl type wand, with transforming powers. Kano's is modeled after the staffs used in fantasy role-playing games, fitting alongside her various tiers of elemental magic and her unique gauge. In the Rune Factory series, the player can purchase staffs and wands that significantly amplify magic power (particularly offensive spells like Fireball). Phantasy Star Online has Rods, Canes(staves), and Wands available to Forces. Rods are basic, canes have longer reach, and Wands give a bonus to your Magic stats. Phantasy Star Universe uses the second variety; Wands are one type of weapon used by the Force and -techer classes to cast TECHNICs, PSU's answer to magic. TECHNICs must be linked to a Wand, Rod or TCSM (TECHNIC Combat Support Machine) before they can be used. These weapons can be equipped only by the only the Force, Guntecher, Wartecher, Fortetecher and Acrotecher classes in the first place. The wands in Phantasy Star Online 2 actually have significantly higher physical attack power then the other tech-based weapons (Rods and talises) at the cost of a small amount of tech attack. The Techer class has abilities and skills that encourage the use of the weapon for melee combat and is also the only class capable of using the weapon under normal circumstances. To note, the wands tend to look like bulky maces or even swords to enforce its close combat capability. In the first game of the Xenosaga series, MOMO used one as part of her Magical Girl gimmick. While it could be used with melee attacks, it's a bit better off having her shoot beams of energy from them (or just having her stand back unleashing Ether, the game's version of magic). She eventually replaces it with a better weapon - bow and arrow. In LostMagic, you get the one of your father - and may or may not make your own from a magical tree later on. Ultima IV has magic wands which, rather than enhancing magic, served as a high-level ranged weapon. System Shock 2 features the psy-amp, which is used to activate all the psychic powers in the game. In Touhou there are LOTS of magical girls that have their own magical wands: Marisa Kirisame has a tiny octagonal object called Hakkero, and sometimes she wields a real magical wand too, Alice Margatroid has got gunpowder-filled living dolls, Sariel has got a wand, Mima a scepter, Byakuren Hijiri has a strange-buddhist-rainbow-shiny-scroll, Seiga Kaku has a wand/pin that creates holes in the walls. In Disgaea, humanoid demons can equip staves to increase their magic power, and raising their Staff skill increases their magic's maximum range and area of effect. Monsters can only equip special "monster weapons", so magic-using monsters tend to be significantly less effective. Until Disgaea 3, when staffs were nerfed to a fixed, single cell range boost, and book weapons were added for monsters with the same property. In Lunar: Eternal Blue, Lemina can equip staves that let her cast spells for free as her normal attack. In the Super Mario Bros. games, Kamek, Kammy, and the rest of Bowser's magikoopas are typical wand-carrying wizards. Mario recovers the stolen magic wands from the Koopalings in Super Mario Bros. 3, who use them in their boss fights against Mario. When they return in New Super Mario Bros. Wii, the Koopalings use wands again. In the MMORPG Perfect World, magic weapons are necessary for the three casting classes to have much effect with their spells. Staves in Rappelz increase the power of one's spells, but are generally fairly mediocre weapons in and of themselves. Shadow Hearts 3, Hilda Valentine is a wannabe Magical Girl, thus wields wands to cast and improve her magic strength. Wizards in Heroes of Might and Magic V use these. The mage creatures on the other hand use a scroll for similiar purposes. Liches cast their spells from a book. In both II and III the liches use staves. In II and III the Magi also use staves, which kind of fits, as liches are undead wizards. Also, you can buy/find wands and scrolls in most, if not all, Might and Magic games. Scrolls can be used once, wands can be used many times, but neither of them needs spell points. Quest for Glory lets Wizard characters obtain a magic staff in games 3 through 5. In 3 and 4 it's only somewhat useful (no mana consumption while active, but moving at all de-summons it), but it received a major overhaul in 5 (where it has its own regenerating mana supply and can be used until it runs out and needs a recharge, greatly extending the player's mana) and became useful. In Guild Wars, wands give their wielder a simple magical attack and are typically paired with focus items which grant additional energy. Staves are a two-handed alternative that combine a wand and focus. In Torchlight wands basically act like magical versions of the guns characters can wield. Wands Akimbo is possible. Staves are just big blunt instruments with added elemental damage used to bash your enemies' brains out of their skulls. Kingdom of Loathing has two useful wands. The first is a set of identical wands from the Dungeons Of Doom, which when used allow you to turn an item into a similar one. The other is the Wand of Nagamar, which somehow transforms things via anagram. It's required to beat the Final Boss. Less plot-relevantly, there's the "fishy wand" item, which your familiar can use to cast Harry Potter-esque spells. Rosalina, adoptive mother of the universe, uses one in Super Mario Galaxy. In her Super Smash Bros. appearance, she uses it both to cast spells and as a magically-augmented bludgeon. In the Dragon Age: Origins DLC Witch Hunt, there is a scribbled note from an irritated student in a book about magic wands in the Circle Tower's library that reads "What kind of self-respecting mage uses a wand, anyway? ", one of several references to the Harry Potter series. Dragon Age mages use staffs. In The Legend of Zelda, the Magic Wand item which shoots a burst of magic. It can be augmented with the Magic Book to produce fire where the spell lands, but this can end up weakening the Wand as enemies immune to fire are now immune to the Wand too. In The Legend of Zelda: A Link to the Past, the Rods of Ice and Fire (self-explanatory), and the Canes of Byrna and Somaria, which create defensive forcefields and magical blocks, respectively. These could be considered Magic Staves, except that they can't be used offensively. The Fire Rod returns as the treasure of Turtle Rock in The Legend of Zelda: Link's Awakening. The eponymous wand in Wand of Gamelon. In Oracle Of Seasons, Link changes season by means of the Rod of Seasons. The titular Wind Waker in The Legend of Zelda: The Wind Waker controls the winds (and a few other things) and is meant to be a conductor's baton. In The Legend of Zelda: Twilight Princess, the Dominion Rod controls ancient magitek, such as statues. The Legend of Zelda: Spirit Tracks features the Sand Wand, which solidifies sand into pillars and stops Quicksand from sucking. The Legend of Zelda: A Link Between Worlds brings back the Sand Wand (now known as Sand Rod), the Fire and Ice Rods, and introduces the Tornado Rod. The latter item allows Link to eject upwards with the help of a powerful gale, allowing him to hop onto moving platforms from above, remove dirt from the floor, and stun enemies. All four rods, like all other items for sale in Ravio's shop, can be later upgraded to increase the gale's range. Dark Souls has three different types of magic wands for each of its three schools of magic. Sorcery actually uses stereotypical wands, while miracles has religious talismans and pyromancy has a flaming hand. Euphonia, Berio's Aether Relic in Duel Savior Destiny, takes the form of a magic staff. While she can hit people with it, it's clearly very ineffective. Braixen and Delphox, the evolutions of the Gen VI Pokémon fire starter, have one they use to perform quite a few attacks. In King's Quest III, you need to "borrow" Manannan's magic wand to use magic. Be very careful to return it before he wakes up from his nap, or it's Game Over for you. However, you only use the wand to prepare spells - you just wave the wand over certain items, say the magic incantation, and afterwards said item is all you need in order to cast the spell. Disney Princess Enchanted Journey gives the heroine a magic wand. Throughout Professor Layton vs. Ace Attorney, we're introduced to the Talea Magica, a serpent-entwined rod inlaid with two gemstones. Each gemstone is a different color and represents a different magic spell which can be cast by the witch wielding the rod. Of course, all magic within this game is elaborately faked, anyway — the Talea is just a prop that guides the Shades in setting up their illusions. Since the 8th installment, Da Qiao from Dynasty Warriors dual wields a pair of pugil sticks that function this way by firing magical pink balls at her foes from a distance as part of her Divergent Character Evolution to her little sister Xiao Qiao. Wands in Path of Exile are the only one-handed ranged weapons in the game. Each swing of a wand releases a projectile made of air, and they intrinsically add bonus spell damage, and they are often paired with a shield to aid in a spellcasters's low defenses. Although they're usually used for spells, they can be built for physical damage, which its weapon-specific skills utilize. You can even dual wield them if you wish. Zoe and the various fairies seen in the series are seen using wands, usually zapping Spyro to save his progress. In Spyro Year Of The Dragon, Bianca freehanded her magic. In later games (including the Spyro Reignited Trilogy remake of Year of the Dragon), she is given a wand to be used as a conduit. RWBY: Glynda's weapon is a leather riding crop which she wears in a holster strapped to the outside of her right boot. Whenever she uses her telekinetic Semblance, she wields the riding crop as a wand, pointing it at the target of her power. Objects she's moving through the air will move in accordance with the direction she moves the riding crop in. 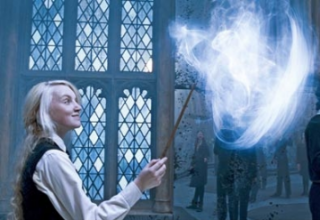 That, combined with the strength and flexibility of her telekinesis, gives her the appearance of performing magical acts, such as the time she fought Cinder — she pointed her wand at the sky which defined the location in which she created a purple circle of glyphs; from that circle, storm clouds appeared and rained down shards of ice which she used her wand and two extended fingers to direct at Cinder's airship like darts. Flamel from Champions of Faraus uses a magic wand to cast spells. Mye from Charby the Vampirate lost her wand moments before entering the story and her magic is severely limited without it. Every magician in Gloomverse gets one of these, matching the theme of their powers. Along with a Nice Hat. In El Goonish Shive, magic wands hold standard preset spells and can be used offensively when dealing with magical threats. The primary limitation of any wand is size; the bigger the wand, the more power it can hold, and therefore the more powerful the spell. A Magic Staff is explicitly just a giant Magic Wand (though they are rarely seen since they're basically magical bazookas), and Tedd is very proud when he is able to miniaturize a wand into a watch that can still hold a useful spell, something no one else has ever managed to do—though it turns out he was accidentally cheating. Homestuck has Rose wielding the Thorns of Oglogoth. She also has another pair of wands, but she doesn't use them since the Thorns are not just magical but eldritch as well - and as such are obscenely powerful. Check it out . Then Eridan gets one for White Magic here . Which might actually have been completely fake, and actually just a Hermione Granger light-up wand. Calliope uses a dualing wand similar in appearance to Eridan's that reportedly actually works...if the WHITE MAGNUM it's paired with is loaded, that is. In The Order of the Stick, Haley buys a small arsenal of wands for a personal cache of ready-to-fire magic. Grimm Shado, a fictional character in Penny Arcade, dual wields wands. He also has triple "wand claws" on each hand, for a total of eight wands. In Sluggy Freelance the parodies of Harry Potter characters use wands. Wizards and witches not based on popular children's books don't seem to, however. Witches use them in Witchy. In Wizard School, (a Hogwarts parody), the students have Harry Potter-style wands. Fairy Godmother, a heroic mystic from the Global Guardians PBEM Universe, uses a wand as a prop but doesn't actually need it to work her magic. This random generator creates written descriptions of magic wands, similar to those in the Harry Potter series. "Foci" in Void Domain collect a mage's latent power for use in magic and are essential for most spells. They can take almost any form: books, bracelets, rings, and traditional wands are used according to preference and convenience. Eva is something of a Wrong Context Mage for being able to channel her power without a focus. Uncle's lizard and blowfish from Jackie Chan Adventures. The Amazing Mumbo uses a wand in Teen Titans; notably, when the wand is broken all of his enchantments are reversed and he is transformed back into an ordinary middle-aged human (as Mumbo he has bright blue skin and cartoony proportions even by the show's standards). However, in later episodes he has a new wand, presumably acquired from wherever he got the first one. In The Fairly OddParents!, fairies have wands. They need them to grant wishes, but sometimes they are capable of performing magic without them. A very frequent plot element is that Cosmo and Wanda get separated from their wands, preventing them from undoing one of Timmy's harmful wishes. In Adventure Time, wands can do anything from shooting rainbows or fireballs to turning feet into birds. Wands are, however, for WIIIIMPS! Being a wizard, Leonard of Ugly Americans naturally has one. The Plot Coupon That Does Something of the My Little Pony 'n Friends serial "The Quest of the Princess Ponies" was a sextet of powerful magic wands belonging to the titular princesses. The wands are so powerful that they can affect the magic of the world, and the villain recklessly draining them throws that magic into destructive disruption. Sunil uses a magic wand in Littlest Pet Shop (2012). He is unable to perform any magic without it. In Barbie and the Secret Door, both the heroine, Alexa, and the Big Bad, Malucia, have magic wands. Malucia uses her wand to drain others' magic. Ancestral Mythix wands in Winx Club. The main character of Star vs. the Forces of Evil wields a wand that's an heirloom passed down through members of her family. It transforms based on who's currently holding it. It's powered by a tiny unicorn running on a treadmill, needs a jewel like plug-in on the bottom called a charger to remain functional, and can be transformed into weapons to suit the users needs. It's main use is The Power of Creation, potent enough to put the royal family in power, apparently accidentally delete physical laws across the multiverse, and obviously serve as the MacGuffin for the series Big Bad. Most amazingly of all, it's implied by the Trickster Mentor for wielders to only skim the surface of manipulating magical forces. It's possible for Star to "dip down" and achieve a greater depth of magical power. Magnifo from Mixels wields a pair of them. They're able to shoot out magic bursts, teleport him and the other Wiztastics, and perform standard stage magic as well. Aquamarine from Steven Universe wields a wand that transforms into a ribbon she wears on her head, befitting her fairy-like appearance. It can be used to suspend targets with Hard Light. Many real life ceremonial magicians use wands or staves in their rituals to help focus and direct their power or simply for ceremonial purposes. Likewise, a ceremonial knife, sometimes known as an athame, is often used for the same purpose. There are a wide variety of trick wands available for budding stage magicians, though the stereotype of the top-hat-and-tails magician with the white-tipped black wand has disappeared from the professional arena. Batons and rods are still widely used by conductors, parade leaders, and masters of ceremony. You can even study baton twirling if you're on a drill team. A common gag among children's magicians is a break-away wand, which appears solid in the magicians hands, but collapses as soon as it's handed to a child. Sometimes it's the other way around. This gag is usually repeated several times, sometimes as a running gag throughout a show. Wands are not very common among adult magicians today, however they are usually used during Cups and Balls routines. Wands are also used by various "Deconstructionist" magicians such as The Amazing Jonathan and Penn & Teller. Penn & Teller's signature bullet catch trick introduces two .357 Magnum revolves as "two very special magic wands."